Ever fancy a dressing table in your beautiful bedroom? This elegant dressing table feature.. 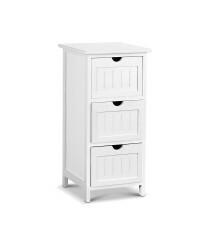 Needing a bedside table to complete your bedroom and white is the main colour? Why not consider ..
With its paneled fascade and air gap handles, our rustic Artiss 3-drawer cabinet exudes charm an..
Made with meticulous craftsmanship, the eco-friendly particle board Dressing Table feature.. Featuring an Exclusive Classic Design, this piece of designer furniture will bring a new retro s..
Gorgeous Look - The fully PU leather upholstered Bravo bed adds a sleek modern vibe to your be..
Indulge in some extravagant rest with our Fabric and Wood Bed Frame. Featuring a strong steel..
Indulge in some extravagant rest with our Linen Fabric and Wood Bed Frame. Padded with high d..
Indulge in some extravagant rest with our PU Leather and Wood Bed Frame. Featuring a strong s.. This elegant dressing table features a 360 degree rotatable mirror and a curvy design that.. Ever fancy a dressing table in your beautiful bedroom? Made of durable particle board and .. 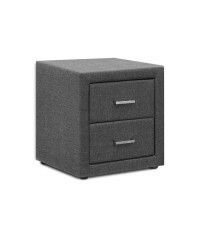 Simply designed with fabric exterior, this bedside table is the perfect furniture to bring a mod..